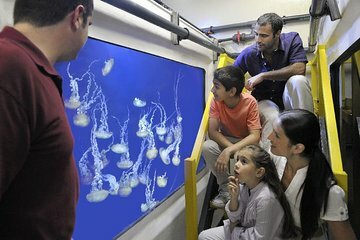 Join the Fish Tales tour at the Lost Chambers Aquarium at Dubai's Atlantis The Palm on this fascinating tour. With an informative aquarist, slip inside the secret world behind the lagoons and observe the aquatic life, state-of-the-art fish hospital and fish food zone, where the critters’ meals are prepared. Then, take part in a scheduled feeding session, with the opportunity to feed a few of the creatures yourself. Numbers on this behind-the-scenes tour are limited to six people for a more personalized experience.